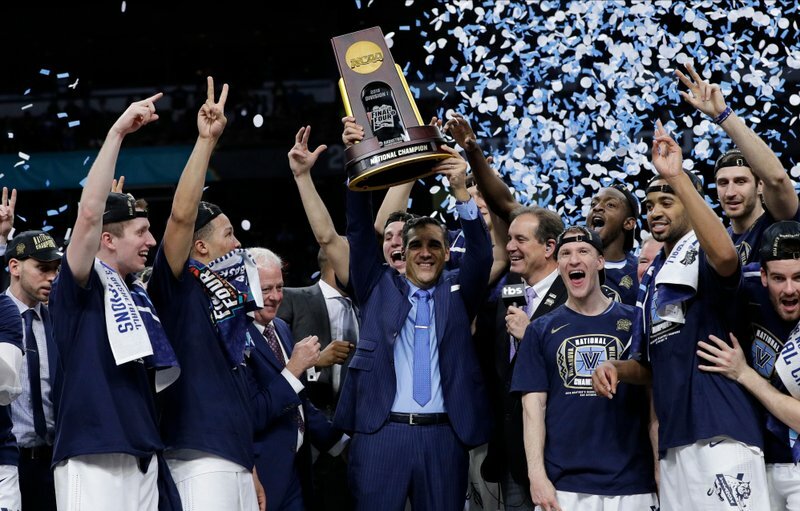 Not all too long ago, Jay Wright was still one of those many standout coaches without a national championship despite repeated winning seasons and appearances in the NCAA Tournament. Less than two years and a Texas two-step of titles later, the sharp-dressed Villanova coach is now in very select company. [post_ads]With the Wildcats’ 79-62 win over Michigan in the Alamodome on Monday night, Wright joined Duke’s Mike Krzyzewski and North Carolina’s Roy Williams as the only active coaches with multiple NCAA titles. Like it not, a lot of coaches are now looking up to Wright. He is only the 14th coach overall with more than one championship, a list topped by John Wooden’s 10 at UCLA. Villanova waited 31 years to win another championship after getting its first with coach Rollie Massimino in 1985. Wright and the Wildcats didn’t have to wait very long at all to add to that total. Only two days shy of the second anniversary of the title they won about 200 miles away in Houston when Kris Jenkins made a buzzer-beating 3-pointer against North Carolina, they were cutting down the nets again. The Wildcats wrapped up Wright’s 17th season with 36 wins, a school record. It was his 422nd win at Villanova after 122 wins and back-to-back NCAA Tournaments in the last of his seven seasons at Hofstra. Sophomore guard Donte DiVincenzo said Wright’s strength is he doesn’t coach everyone the same way, and instead conforms his coaching style to what best fits the player. Junior guard Phil Booth said Wright certainly deserves to be “up there with the best of the best” like Coach K (five titles) and Williams (three). After making it to the Final Four in 2009, the Wildcats had a six-season span when they made the NCAA Tournament five times and never got past the first weekend. That changed with their title run in 2016, before another loss in their second tournament game last season. Then in this wild NCAA Tournament with AP Player of the Year Jalen Brunson and DiVencenzo’s big outburst in the finale, the Wildcats were never challenged late. They won all six of their tournament games by double figures. “It’s very humbling to know that we’ve been able to do this. ... Our goal is never to win a national championship,” he said. “Our goal is just to be the best team we can be by the end of the year. We judge ourselves differently. When we get knocked out in the second round, we were disappointed that we lost, but we weren’t disappointed in our effort.